Niantic has announced that an augmented reality photo mode is coming to Pokemon GO in an upcoming update. 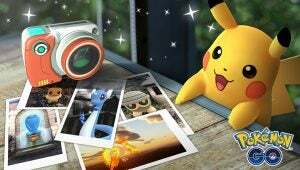 The long-awaited feature has been requested by fans ever since the game’s release, eager for the opportunity to take photographs of Pokemon in real-life locations. Since launch, the only way to capture images of your Pokemon via augmented reality has been during the catching process, making things a tiny bit limited. Many players have build up colossal collections of Pokemon, and this new update will allow you to release them to take photos at your pleasure. Hopefully that includes some potentially awesome selfies. In terms of progress, datamines suggest that new badges and achievements will be handed out to those who are trigger happy with the new feature. Niantic is yet to announce a release date for this update, although has said it’s been in the testing phases for a long time now. Fingers crossed the wait isn’t too long. While it isn’t exactly a sequel to Pokemon Snap for Nintendo 64, it’s probably the closest we’re going to get for a good while. Are you excited for this Pokemon GO update? Let us know on Facebook and Twitter @trustedreviews. The post Pokemon GO finally gets AR Photo mode in upcoming update appeared first on Trusted Reviews.